I won't deny that there are many days that leave me wanting to scream. Hearing my name spoken 4,000 times in an hour causes my temper to flare in the most unflattering ways, and I often find myself crying over spilled milk (literally). 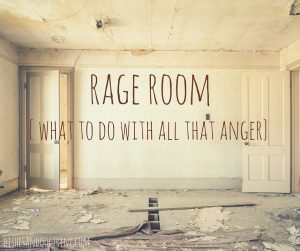 I was so intrigued, though, to watch a news segment recently about a new fad in Texas called a Rage Room. Customers pay $50 for 15 minutes of tantrum time. They enter a room filled with junk (TV's, furniture, tires, etc...) and are allowed to beat, break, and smash anything and everything in sight. Those interviewed mentioned that they were able to relieve built-up stress and bitterness by physically destroying the items in the room. Critics believe that this kind of behavior will not help anger issues, but rather create new habits of violence which are instigated when stress levels rise. Oftentimes, actually owning up to the bubbling anger inside of me is one of the hardest steps. Among the spills, broken furniture, and sibling rivalry, I can find many good reasons to excuse away my temper. It's so much easier to blame the ones around me than to identify my behavior (and thoughts) as sinful. Once I admit and identify my tendency to lean on my fallen nature rather than Christ, I am able move forward. Anger like all sin is extremely damaging not only to the one "blowing up" but to those who happen to be around at the time. Words said in a moment of frustration can linger in the mind of the attacked for a very long time. I don't think that the destruction of as many items as possible in a quarter-hour is the answer to our anger issues, but I do think that heading somewhere apart from others (ie. a bedroom, office, etc...) when the temper flares is a great practical way to minimize the harm to others. Taking a step back from the situation when possible also allows for confession and reflection with the Father which brings us to the third anger tip. Christ shattered the chains of sin freeing us to speak and act with love and grace to those around us. The Holy Spirit offers the only power that will conquer the anger problem in your life and He doesn't even need a hammer!